Are you like Oprah and just love bread? Well here is a healthy and delicious way to get in your beloved bread without worrying about increasing bodyfat. 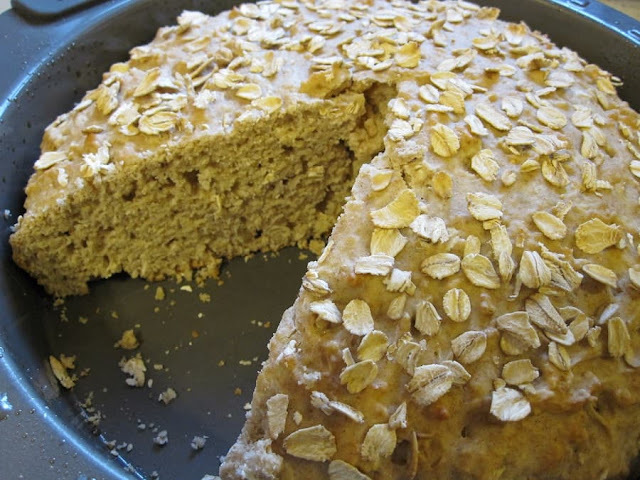 Introducing the hearty oat loaf bread recipe! In a large bowl, combine the flours, 1/2 cup oats, sugar, baking powder, and salt. In another bowl, combine the egg, milk, and oil; stir into dry ingredients just until moistened. Spread batter into an 8- or 9-in. round baking pan coated with nonstick cooking spray. Sprinkle with the remaining oats. Bake at 350 degrees for 40-50 minutes or until a toothpick inserted near the center comes out clean. Cool for 5 minutes before removing from pan to a wire rack. Serve warm and love the bread that loves you back on a budget! I hope you enjoyed this recipe for hearty oat loaf bread that has a higher amount of heart healthy and waist-friendly level of complex carbs and fiber. Interested in more frugal fitness healthy recipes?